Built in 1927 and listed on the National Register of Historic Places, the hotel once served as a makeshift Capitol during a dispute between Long and Lieutenant Governor Paul Cyr. A newly elected senator, Long refused to relinquish his duties as governor, prompting Cyr to set up operations in the hotel. 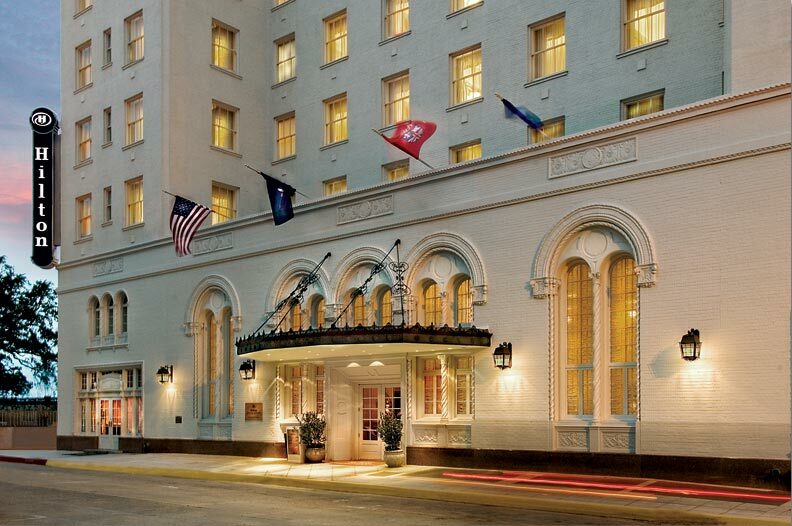 Despite its storied history, the Heidelberg Hotel lay dormant for 25 years—until 2006, when a $70-million restoration rechristened it as the Hilton Baton Rouge Capitol Center. 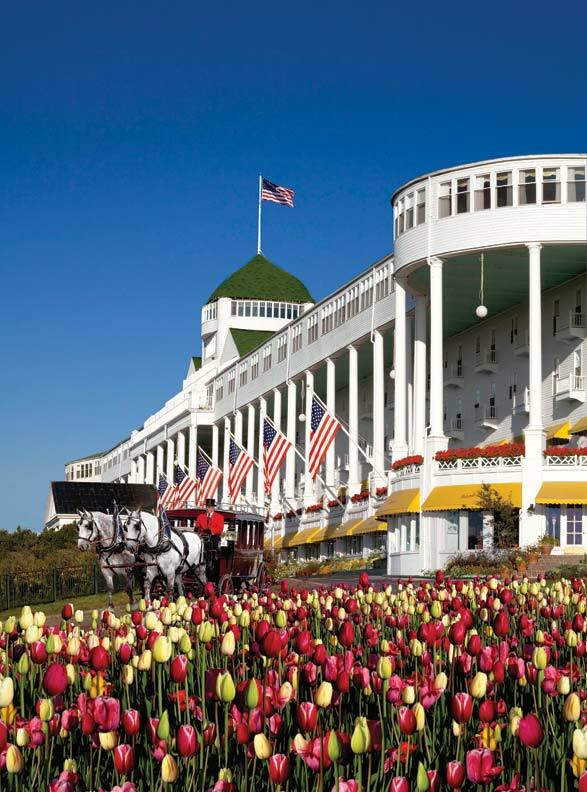 Subject to countless renovations over the years before being shuttered in the 1970s, most of the hotel’s original materials and furnishings were long gone. Restoration and architectural details were drawn from original blueprints, old photos, details in the 1930 Old Governor’s Mansion (built by Long) and the Old State Capitol, and knowledge of the Art Deco era. Architect Buddy Ragland of Coleman & Partners admits it took some time to learn the bones of the building. He found a partial set of blueprints in the basement and began comparing the prints to the interior structure. One of his team’s first discoveries was that the lobby had originally been an open two-story space with a mezzanine. 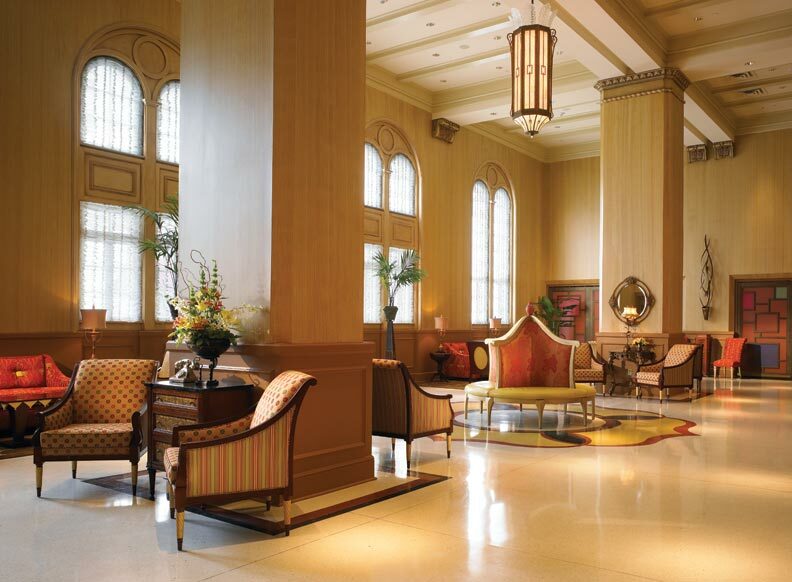 The 2006 restoration returned the lobby to its previous incarnation as an elegant two-story space full of Art Deco flourishes. They found original architectural materials and used them to re-establish, repair, and replace major components of the building. In the 10th-floor ballroom, they uncovered original plasterwork on the ceiling that they used as a model for reproductions in the lobby. 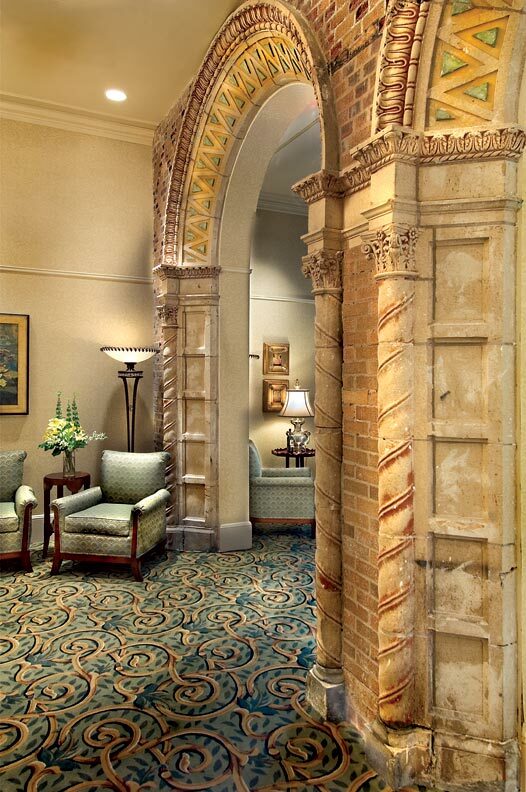 Behind a ballroom wall, they found an arched wall of exterior masonry and terracotta tile preserved in its original form; it’s now on display in a room adjacent to the ballroom. An original exterior wall was uncovered and restored near the ballroom. Most of the ornate original first-floor façade was missing, except for a few pieces of plaster and window trim sandwiched in a solid brick wall that had been built over the original façade in the 1950s. “There were just enough trim pieces to make rubber castings so we could replicate it in its original scale and proportion,” Ragland says. 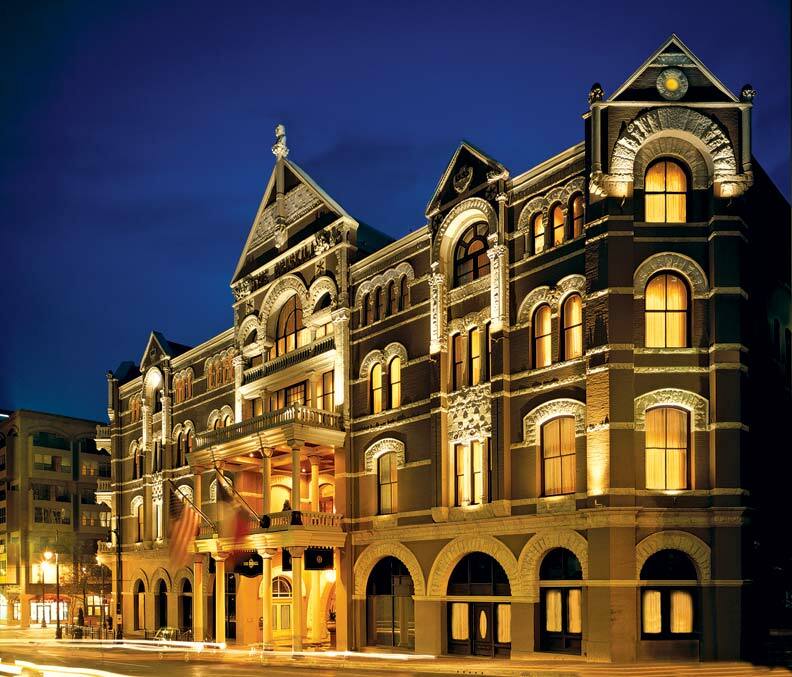 The windows on the ground-level façade now sport copies of their original hoods; the scrollwork running along the length of each window was modeled after an original piece of trim found on the ballroom ceiling. While original wooden double-hung sash windows were too rotten, damaged, or broken to save, they were intact enough to provide a template for new energy-efficient wooden sash windows. “The mullion profiles and number of divided lights all passed the scrutiny in restoring the building to its original look,” Ragland says. Meanwhile, interior designer Lisa Condon of Lisambience Design researched Art Deco designs to incorporate in the guest rooms. “We used a gazelle print on bolsters for the bedding and an organic print on guest room draperies,” she says. The lamps and nightstands were custom-designed based on 1920s and ’30s examples, while the headboard design came from Governor Jimmie Davis’ bed in the Old Governor’s Mansion. The lobby has similar terrazzo flooring to the ballroom (where it was reproduced based on historic photos of the hotel), but with some additional Art Deco designs. Colors were drawn from the time period, the Old Capitol, and the Old Governor’s Mansion. The sconces in the hallways are modeled after ones in the Chrysler Building, built during the same time frame. 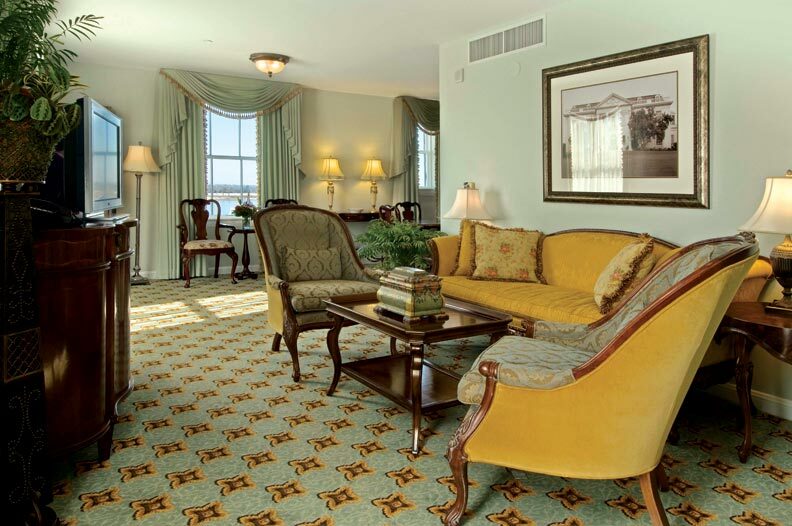 The Huey P. Long Suite is decorated with reprints of historical photos relating to the legendary Louisiana governor. Even more research went into decorating the Huey P. Long Suite. Condon and Carolyn Bennett, executive director of the Old Governor’s Mansion, went to the historic library at Louisiana State University and spent hours sifting through boxes of Huey Long photos. Reprints of the photos they uncovered are scattered throughout the suite, giving it a more personal appeal. “The political pictures went in the living area, LSU photos in the kitchen, and family snapshots in the bedroom,” says Condon, adding that the sage green color on the walls was copied from Long’s bedroom in the Old Governor’s Mansion. The 1920s flair continues in the Kingfish Bar, which is furnished with vibrant tufted fabric in geometric designs and curtains draped in cut glass tubing. 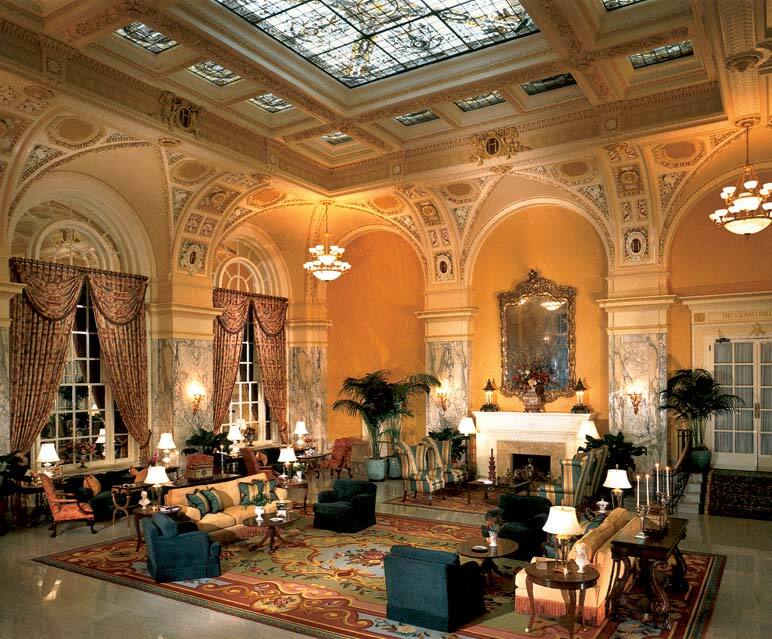 As you sip on one of Long’s favorite cocktails (a sazerac or sloe gin fizz), you might just be convinced that you hear the whispers of the governor’s infamous “deal making” in this setting that has so convincingly recaptured his era.